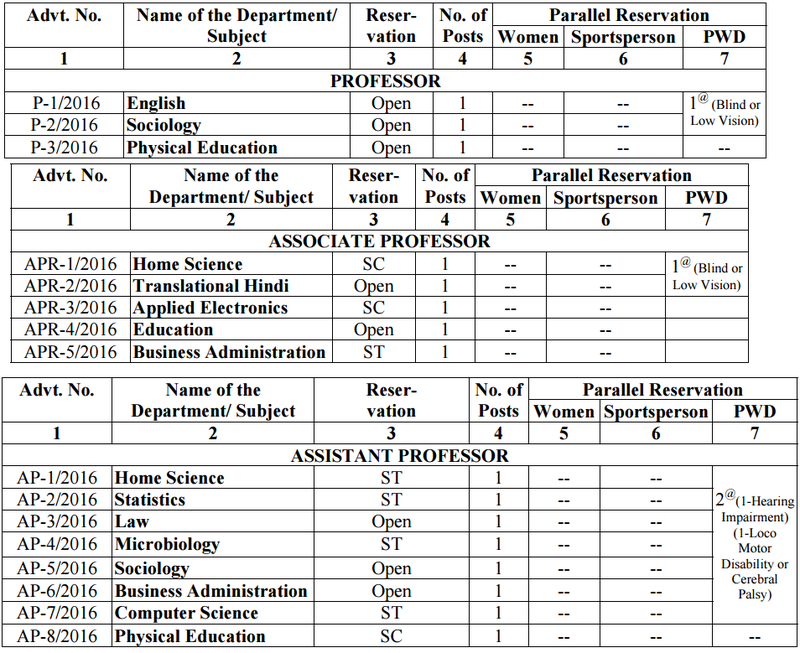 SGBAU invited applications for recruitment to 16 Professor & Other posts. The candidates eligible for the post can apply through prescribed format on or before 14 December 2016. Sant Gadge Baba Amravati University (SGBAU) Job Notification: SGBAU invited applications for recruitment to 16 Professor & Other posts in various University Post Graduate Teaching Departments sanctioned by the State Government. The candidates eligible for the post can apply through prescribed format on or before 14 December 2016. Educational Qualification for Professor (Sociology, English) Post: A. i. An eminent scholar with Ph.D. qualification(s) in the concerned/allied/relevant discipline and published work of high quality, actively engaged in research with evidence of published work with a minimum of 10 publications as books and/or research/policy papers. ii. A minimum of ten years of teaching experience in university/college, and/or experience in research at the University/National level institutions/industries, including experience of guiding candidates for research at doctoral level. iii. Contribution to educational innovation, design of new curricula and courses, and technology – mediated teaching learning process. iv. A minimum score as stipulated in the Academic Performance Indicator (API) based Performance Based Appraisal System (PBAS), set out in Tables No. II (C) of Appendix III of UGC Regulation 2010. (Available on University Website- www.sgbau.ac.in/universitypublications/Directions/Dir.No.42/2011) B. An outstanding professional, with established reputation in the relevant field, who has made significant contributions to the knowledge in the concerned/allied/relevant discipline, to be substantiated by credentials. Educational Qualification for Professor (Physical Education) Post: a. A Postgraduate Degree in Physical Education(M.P.Ed./M.P.E.) with 55% marks or its equivalent grade. b. Ph.D. in the area of Physical Education. c. At least ten years teaching / research experience in a department / college of Physical Education out of which at least five years in the post graduate institution / University department. d. A minimum score as stipulated in the Academic Performance Indicator (API) based Performance Based Appraisal System (PBAS), set out in Tables No. II (C) of Appendix III. (Available on University Website www.sgbau.ac.in/universitypublications/Directions/Dir.No.42/2011). Educational Qualification for Associate Professor (Home Science, Translational Hindi,) Post: i. Good academic record with a Ph.D. Degree in the concerned/allied/relevant disciplines. ii. A Master’s Degree with at least 55% marks (or an equivalent grade in a point scale wherever grading system is followed). iii. A minimum of eight years of experience of teaching and/or research in an academic/research position equivalent to that of Assistant Professor in a University, College or Accredited Research Institution/industry excluding the period of Ph.D. research with evidence of published work and a minimum of 5 publications as books and/or research/policy papers. iv. Contribution to educational innovation, design of new curricula and courses, and technology – mediated teaching learning process with evidence of having guided doctoral candidates and research students. v) A minimum score as stipulated in the Academic Performance Indicator (API) based Performance Based Appraisal System (PBAS), set out in Tables No. II(C) of Appendix III. (Available on University Websitewww.sgbau.ac.in/universitypublications/Directions/Dir.No.42/2011). Educational Qualification for Associate Professor (Applied Electronics) Post: a. BE / B. Tech. and ME / M. Tech in relevant branch with First Class or equivalent either in BE / B. Tech or ME / M.Tech. and Ph.D. or equivalent, in appropriate discipline. b. Post Ph.D. publications and guiding Ph.D. student is highly desirable. c. Minimum of 5 years experience in teaching/research/industry of which 2 years post Ph.D. experience is desirable. d. A minimum score as stipulated in the Academic Performance Indicator (API) based Performance Based Appraisal System (PBAS), set out in this Tables No. II(C). (Available on University Website www.sgbau.ac.in/universitypublications/Directions/Dir.No.21/2013). Educational Qualification for Associate Professor (Education) Post: a. A Postgraduate Degree with minimum 55% marks in the discipline relevant to the area of specialization. b. Postgraduate Degree in Education (M.Ed./M.A. Education ) with minimum 55% marks. c. Ph.D. degree in Education or in the discipline relevant to the area of specialization. d. At least eight years teaching/ research experience in a department / college of Education out of which at least three years at the post graduate level and has published work in relevant areas of specialization. e. A minimum score as stipulated in the Academic Performance Indicator (API) based Performance Based Appraisal System (PBAS), set out in Tables No. II(C) of Appendix III. (Available on University Website www.sgbau.ac.in/universitypublications/Directions/Dir.No.42/2011). Educational Qualification for Associate Professor (Business Administration) Post: a. First Class or equivalent in Masters Degree in Business Administration or equivalent. b. Ph.D. or equivalent in appropriate discipline. Post Ph.D. publications and guiding Ph.D. student is highly desirable. c. Minimum of 5 years experience in teaching/research/industry of which 2 years post Ph.D. experience is desirable. d. A minimum score as stipulated in the Academic Performance Indicator (API) based Performance Based Appraisal System (PBAS), set out in Tables No. II(C) (Available on University Website www.sgbau.ac.in/universitypublications/Directions/Dir.No.21/2013). Educational Qualification for Assistant Professor (Home Science, Statistics, Law, Microbiology, Sociology) Post: i. Good academic record as defined by the concerned university with at least 55% marks(or an equivalent grade in a point scale wherever grading system is followed) at the Master’s Degree level in a relevant subject from an Indian University, or an equivalent degree from an accredited foreign university. ii. Besides fulfilling the above qualifications, the candidate must have cleared the National Eligibility Test (NET) conducted by the UGC, CSIR or similar test accredited by the UGC like SLET/SET. iii. Notwithstanding anything contained in sub-clauses (i) and (ii), the candidates who are, or have been awarded a Ph.D. Degree in accordance with the University Grants Commission (Minimum Standards and Procedure for Award of Ph.D. Degree) Regulations, 2009, shall be exempted from the requirement of the minimum eligibility condition of NET/SLET/SET for recruitment and appointment of Assistant Professor in Universities. iv. NET/SLET/SET shall also not be required for such Masters Programmes in disciplines for which NET/SLET/SET is not conducted. v. A minimum score as stipulated in the Academic Performance Indicator (API) based Performance Based Appraisal System (PBAS), set out in Tables No. II(C) of Appendix III. (Available on University Website www.sgbau.ac.in/universitypublications /Directions/ Dir.No.42/2011). Educational Qualification for Assistant Professor (Business Administration & Management) Post: First Class or equivalent in Masters Degree in Business Administration or equivalent and two years relevant Experience is desirable A minimum score as stipulated in the Academic Performance Indicator (API) based Performance Based Appraisal System (PBAS), set out in Tables No. II(C). (Available on University Website www.sgbau.ac.in/universitypublications/Directions/Dir.No.21/2013). Educational Qualification for Assistant Professor (Computer Science) Post: i. First Class Master’s Degree in the appropriate branch of Engineering (Engg.) & Technology (Tech). ii. Without prejudice to the above, the following conditions may be considered desirable: 1. Teaching, research industrial and / or professional experience in a reputed organization; 2. Papers presented at Conferences and / or in referred journals.OR B.E./B.Tech. and MCA with First Class or equivalent in either B.E./B.Tech. or M.C.A. OR M.C.A. with First Class or equivalent with two years relevant experience. OR i. Good academic record as defined by the concerned university with at least 55% marks (or an equivalent grade in a point scale wherever grading system is followed) at the Master’s Degree level in a relevant subject from an Indian University, or an equivalent degree from an accredited foreign university. ii. Besides fulfilling the above qualifications, the candidate must have cleared the National Eligibility Test (NET) conducted by the UGC, CSIR or similar test accredited by the UGC like SLET/SET. iii. Notwithstanding anything contained in sub-clauses (i) and (ii) above, candidates, who are, or have been awarded a Ph. D. Degree in accordance with the University Grants Commission (Minimum Standards and Procedure for Award of Ph.D. Degree) Regulations, 2009, shall be exempted from the requirement of the minimum eligibility condition of NET/SLET/SET for recruitment and appointment of Assistant Professor or equivalent positions in Universities/Colleges/Institutions. iv. A minimum score as stipulated in the Academic Performance Indicator (API) based Performance Based Appraisal System (PBAS), set out in Tables No. II(C) (Available on University Website www.sgbau.ac.in/universitypublications/Directions/ Dir.No.21/2013). Educational Qualification for Assistant Professor (Physical Education) Post: i) Master’s degree in Physical Education(M.P.Ed./M.P.E.) with at least fifty five percent marks or an equivalent grade in a point scale wherever grading system is followed. ii) Besides fulfilling the above qualifications, the candidate must have cleared the National Eligibility Test (NET) conducted by the UGC, CSIR or similar test accredited by the UGC like SLET /SET in the subject Physical Education. iii)Notwithstanding anything contained in sub-clauses (i) and (ii) above, candidates, who are, or have been awarded a Ph. D. Degree in accordance with the University Grants Commission (Minimum Standards and Procedure for Award of Ph.D. Degree) Regulations, 2009, shall be exempted from the requirement of the minimum eligibility condition of NET/SLET/SET for recruitment and appointment of Assistant Professor or equivalent positions in Universities/Colleges/Institutions iv)A minimum score as stipulated in the Academic Performance Indicator (API) based Performance Based Appraisal System (PBAS), set out in Tables No. II(C) of Appendix III. (Available on University Website www.sgbau.ac.in/universitypublications/Directions/Dir.No.42/2011). Interested and eligible candidates are required to send prescribed Application Forms with details of qualifications, experience & other conditions etc. can be had on Non Refundable payment of Rs. 400 /- [ Rs. 200 /- in case of B.C. candidates] by cash / Demand Draft in favor of President, Sant Gadge Baba Amravati University Employees’ Credit Cooperative Society, Amravati Ltd. up to the LAST DATE from the counter of Sant Gadge Baba Amravati University Employees’ Credit Co-operative Society, near Main Administrative Building, University Campus, Amravati during office hours. The application form can also be downloaded from our website www.sgbau.ac.in. In this case, the application should be submitted with Demand Draft of Rs.400/- (Rs.200/- in case of BC candidates) (non refundable) of Nationalized Bank drawn in favor of Registrar, Sant Gadge Baba Amravati University, Amravati.